CONNECTING SOUTH JERSEY TO THE BETSY ROSS BRIDGE: In 1963, the Delaware River Port Authority (DRPA) proposed two new crossings of the Delaware River to alleviate congestion on the Benjamin Franklin and Walt Whitman bridges between Philadelphia and southern New Jersey. 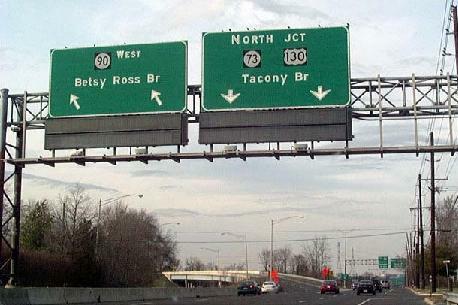 The more northerly of the two new crossings, the Betsy Ross (Delair) Bridge, was to connect Pennsauken, New Jersey with the Bridesburg section of Philadelphia. The NJ 90 Freeway, which will be on new alignment, will connect with the proposed Delair (Betsy Ross) Bridge over the Delaware River in Pennsauken, and NJ 73 in the vicinity of Church Road in Mount Laurel Township. It will provide a corridor for traffic north and east of the Camden-Philadelphia metropolitan area destined for New Jersey shore resorts, bypassing built-up areas. This route will also relieve existing NJ 70, NJ 73 and US 130. The state submitted the proposed NJ 90 Freeway and Betsy Ross Bridge for inclusion into the Interstate highway system Interstate highway system to the Federal Highway Administration (FHWA) in 1970. However, the FHWA denied the request. Construction of the Betsy Ross Bridge and its approaches began in 1969. Although the bridge was completed in 1974, its opening was delayed by two years over controversies surrounding the approaches on either side of the Delaware River. The initial 2.3-mile-long, six-lane section of the NJ 90 Freeway, which stretched from the Betsy Ross Bridge east to US 130 in Pennsauken, opened to traffic on April 30, 1976. CUT SHORT IN CINNAMINSON: In 1984, Governor Thomas Kean approved a shortened extension of the NJ 90 Freeway under the statewide transportation trust fund. When construction began in March 1986, accommodations had to be made for heightened environmental concerns. Five viaducts were built over Pennsauken Creek, the ecologically sensitive home for local waterfowl. The 0.8-mile-long, four-lane eastern extension to NJ 73 in Cinnaminson opened to traffic on October 25, 1988. The NJ 90 extension project cost the NJDOT $23 million, of which $6.5 million was reimbursed by the DRPA. According to the NJDOT, the NJ 90 Freeway carries approximately 45,000 vehicles per day (AADT) at the Betsy Ross Bridge toll plaza, falling to approximately 30,000 vehicles per day east of US 130. The speed limit along the entire length of the NJ 90 Freeway is 45 MPH. EXTENDING TO MOUNT LAUREL: As originally envisioned by the NJDOT, the DRPA and the DVRPC in 1964, the NJ 90 Freeway was to have been an integral part of a two-state freeway network. To the east of the Betsy Ross Bridge, the east-west route was to connect to I-295 and the New Jersey Turnpike, the two principal north-south express routes through southern New Jersey, in the area of Mount Laurel. RED ROUTE: Beginning in the vicinity of Velde Avenue (Betsy Ross Bridge approach) in Pennsauken, the freeway was to continue directly southeast of US 130 through heavily developed areas of Cherry Hill, Maple Shade and Mount Laurel, crossing over the South Branch of Pennsauken Creek four times. In Mount Laurel Township, NJ 90 was to intersect I-295 (at milepost 34) and the New Jersey Turnpike (about one and one-half miles south of EXIT 4). It was to end at NJ 73 (near Lincoln Drive) in Marlton Township. This alternative encountered vociferous opposition from residents of Cherry Hill, Maple Shade and Mount Laurel townships, and was soon abandoned. GREEN ROUTE: In response, officials developed a more northerly route that avoided residential areas. Also beginning in the vicinity of Velde Avenue (Betsy Ross Bridge approach) in Pennsauken, NJ 30 was to veer east of US 130 toward NJ 73 in Cinnaminson Township (much as it does today), then parallel NJ 73 to the east along the North Branch of Pennsauken Creek toward Mount Laurel. A variation of this alternative had the freeway crossing back south of NJ 73 (between NJ 38 and I-295) to avoid commercial and industrial areas, as well as a New Jersey Turnpike toll plaza (EXIT 4), in Mount Laurel. Under this alternative, NJ 90 was to end at the intersection of NJ 73 and Church Road in Mount Laurel. The Delaware Valley Regional Planning Commission (DVRPC) estimated the cost of the 6.3-mile-long expressway at $42 million. Completion of the freeway had been scheduled for 1975. In 1966, plans developed by the Philadelphia City Planning Commission showed the NJ 90 Freeway connecting to the proposed NJ 38 Freeway, a route that was to have connected the Benjamin Franklin Bridge with the Jersey Shore. In 1969, the DVRPC proposed a 10.2-mile-long, $14 million extension of the NJ 90 Freeway beyond Mount Laurel Township. Designed to relieve congestion along NJ 73, the NJ 90 Freeway extension was to terminate at the proposed US 30 Freeway in Berlin. The extension, which may have been extended further south to the Atlantic City Expressway, was scheduled for completion by 1985. In 1975, the DRPA proposed a new spur of the PATCO high-speed rail line extending along the NJ 90 Freeway median east to the Moorestown area. Due to the potential adverse environmental impact on Pennsauken Creek, as well as to dwindling financial resources, the NJDOT had quietly dropped plans to extend the NJ 90 Freeway beyond Cinnaminson by 1980. IMPROVED ACCESS TO PHILADELPHIA: To further improve access from South Jersey to Philadelphia and alleviate congestion on existing crossings, the NJ 90 Freeway should be extended east to I-295 and the New Jersey Turnpike. As an integral part of the interstate highway network, the extended NJ 90 Freeway should be re-designated I-695. SOURCES: "New Delair Bridge Site OK'd by Three Camden Lawmakers," The Philadelphia Inquirer (12/05/1964); "Realignment of Route 90 at Mount Laurel Asked" by Francis M. Lordan, The Philadelphia Inquirer (10/31/1966); "Philadelphia's Comprehensive Plan for Expressways," Philadelphia City Planning Commission (1966); New Jersey Highway Facts, New Jersey Department of Transportation (1967); 1985 Regional Transportation Plan, Delaware Valley Regional Planning Commission (1969); "Report on the Status of the Federal-Aid Highway Program," Committee on Public Works, U.S. Senate (1970); Mass Transportation Development Program, Delaware River Port Authority and Urban Mass Transportation Administration (1975); "Route 90 Set To Open This Week" by Dianne Gordon-Lyle, The Philadelphia Inquirer (10/23/1988); Raymond C. Martin; Dan Moraseski; Scott Oglesby; Brian Polidoro; Len Pundt; Jeff Taylor. NJ 90 and I-695 shields by Ralph Herman. NJ 90 exit list by Ray Martin.